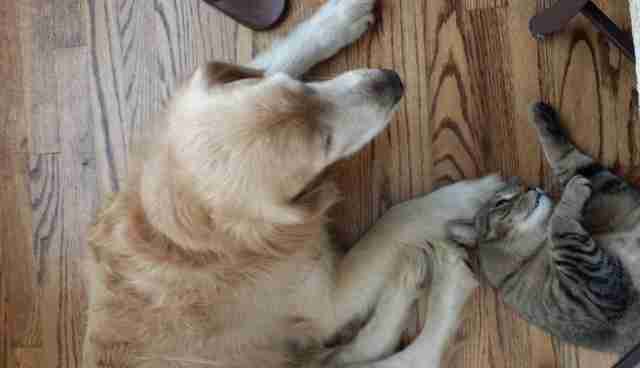 Tucker is a handsome 7-year-old golden retriever living in Houston, Texas. He recently had to undergo surgery - but is already recovering nicely, thanks largely to support from his feline brother, Sokka. 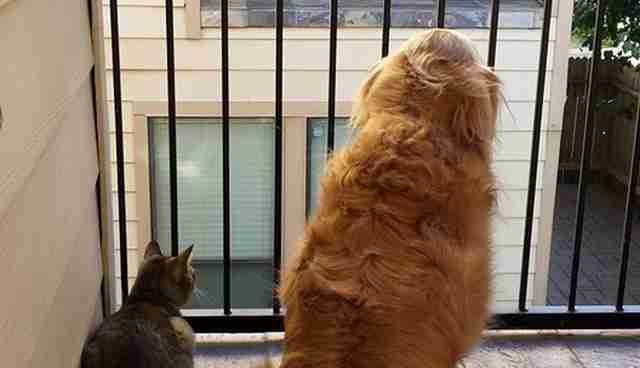 Their dad, known on Reddit by the username washburnmav, has had 2-year-old Sokka since he was a kitten, and adopted Tucker from Golden Beginnings Golden Retriever Rescue about a year later. He had no idea if they'd get along, so he made sure Sokka got a chance to scope out the dog first. "Both animals had never met the other species before, so I knew it might be a challenge," their dad tells The Dodo. "Tucker's foster brought him to my house and that is where the fun began. Sokka was very cautious, moving at a sloth pace, to investigate this new four-legged, smelly animal." After about 10 minutes of scrutiny, the cat decided Tucker was alright. 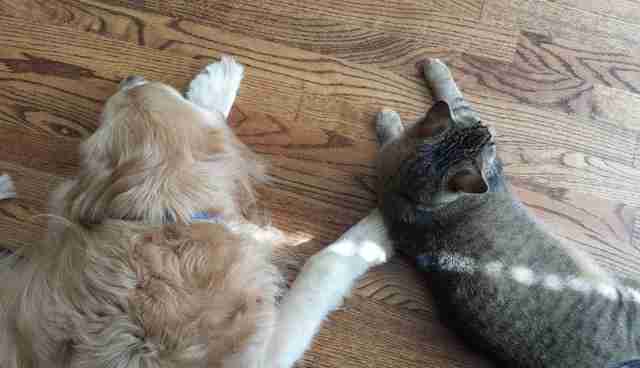 "Sokka touched noses with Tucker, and they were instant brothers," he says. 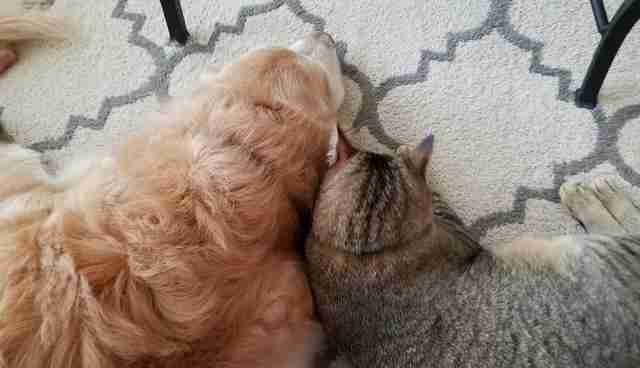 Still, it took a while for the two animals to become as close as they are now. "The first two weeks were touch-and-go, and I wasn't sure they would ever actually 'love' each other (like all my hopes and dreams)," he says. Eventually, Tucker and Sokka really started to bond. One day, for example, Sokka noticed that Tucker's tail would be really fun to play with - and quickly claimed it as his new favorite toy. "The best part was that Tucker was extremely tolerant of this behavior, treating it more like a slightly annoying little brother pulling on him," their dad days, "but he has never snapped at him." But the real closeness began when the animals started to check on each other after vet visits. 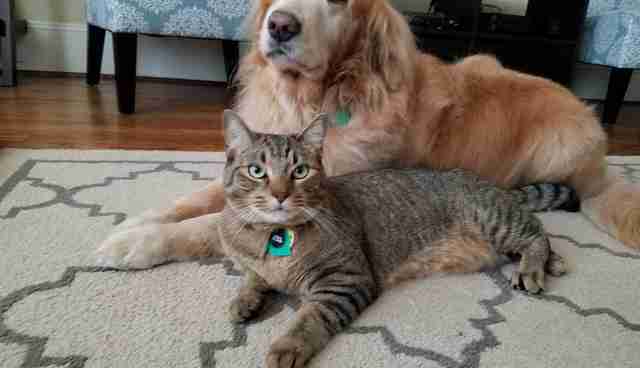 "They tend to go to the vet separately, so when one comes home, the other will carefully sniff them all over, just checking that they are the same fur-brother," their dad says. So, naturally, when Tucker had his recent surgery, Sokka was there to make sure he was alright. Tucker had to have a golfball-sized mass removed from the base of his tail. Although the mass was benign, vets worried that if it grew too big, Tucker would need to have his tail amputated. 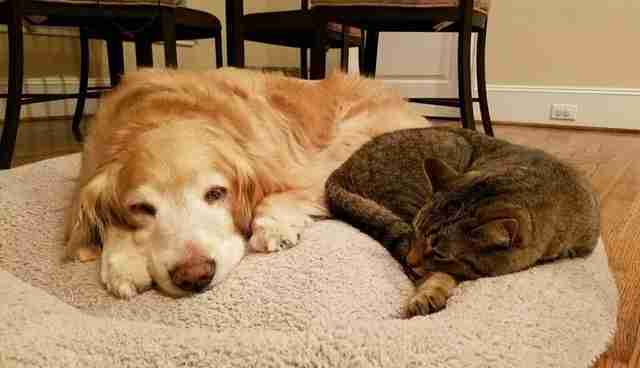 When the dog returned home after the procedure, Sokka knew he needed a friend. Their dad managed to snap a picture of Sokka comforting Tucker, and promptly shared it on Reddit. "A rare cuddle," he writes. 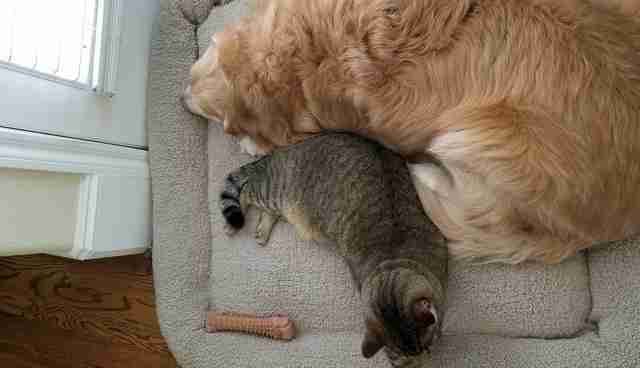 "Our cat comforts our golden after a long day of surgery." It's hard to believe their dad once wondered if they'd even be able tolerate each other. Clearly, he had nothing to worry about. As he says, "These two truly care about each other now."